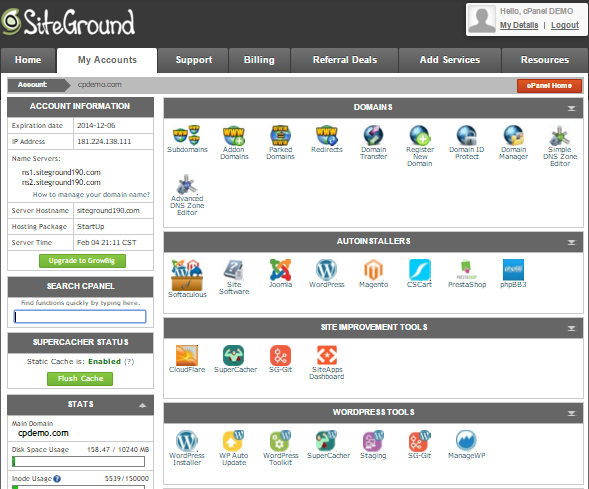 SiteGround is a web hosting company that was founded in Sofia, Bulgaria in 2004. The company currently serves as a host for over half-a-million domains across the globe. They are well known for their customer service and low-cost hosting services. These features are pretty common, however. SiteGround’s website speeds are extremely fast, thanks to their proprietary SuperCacher plugin and solid state drive data storage. Users can choose which server location their site will be hosted on from a list of data centers based in the USA, Holland, the UK, Italy, and Singapore. The customer service agents are courteous and professional. Perhaps the best in the business. Basic plans don’t come with a lot of bandwidth or storage. There is no option to pay month-to-month. SiteGround’s standard web-hosting services come in three sizes. Your first step will be choosing the one that works for you. The StartUp plan offers users 10GB of space, which should be more than enough for a new website. Keep in mind that you can upgrade if you outgrow your plan. Next, you will need to choose a domain name. If you already have a domain, SiteGround will help you transfer it to their servers. If not, you will be able to register one with the service for $14.95 per year. It is worth noting that some web hosts provide a free domain name. Once you choose your domain name you will be required to create an account with the service, providing your personal and payment information. SiteGround’s plans each require a one-year commitment, but new users can sign up for a one-month paid trial period to make sure the service suits them. Additional services offered at signup include domain privacy, which prevents people from finding your information via services like WHOIS, and SG Site Scanner, which you can pay to monitor your website and notify you of issues. SiteGround offers users an abundance of value-added features — even in their most basic plan. Included are unlimited email addresses to give your website a professional flare, daily backups to ensure you never lose your website data, and a free initial setup and website transfer so that you never have to worry about doing the wrong thing. These features are especially good for new users who need a bit of handholding through the initial process, or even when making changes later on. Some web hosts charge for this service, so it’s a particularly generous feature. SiteGround also offers services that appeal to more advanced users. Highlights of their developer-oriented features include SSL encryption, HTTP/2-enabled servers, CloudFlare CDN, NGINX, PHP 7, and cloud and enterprise hosting services. All users will love SiteGround’s SuperCacher feature, which speeds up site loading times and makes the service one of the fastest around. The control panel (cPanel) is your home for making any and all backend changes. You can think of it as your server visualized. SiteGround’s cPanel offers a quick look at all of the options available to you. Not only does it display account information, including your hosting package and disk usage stats, it also has auto-installers for the most common website platforms and tools, including WordPress, Joomla, and Magento. Users with multiple sites can access them all from a single login. SiteGround’s customer support is simply unrivaled. While it’s true that many services offer the same hours and contact options, SiteGround’s staff is highly trained to tackle any problem in an extremely courteous and caring manner. Customer support really shines when you need on-site assistance, like when you initially transfer your pre-existing website or when you have an issue that you need a professional to fix. All tickets are guaranteed to receive a reply within ten minutes, but if you opt for a live chat or phone call, you will be connected with an agent instantly. It’s no wonder the service has a near-100% customer satisfaction rate. SiteGround offers shared, cloud, and enterprise web hosting services. For our review, we assumed that a shared plan would suffice for most users. There are three shared hosting options. The StartUp plan is best for new users. It provides everything you need to get started, including a website, 10GB of space, and all of SiteGround’s essential features. This is sufficient for around 10,000 monthly visitors and initially costs $3.95 per month, billed annually. Once your initial signup period ends (you can choose one, two, or three years at that rate), the cost increases to $9.95 per month. 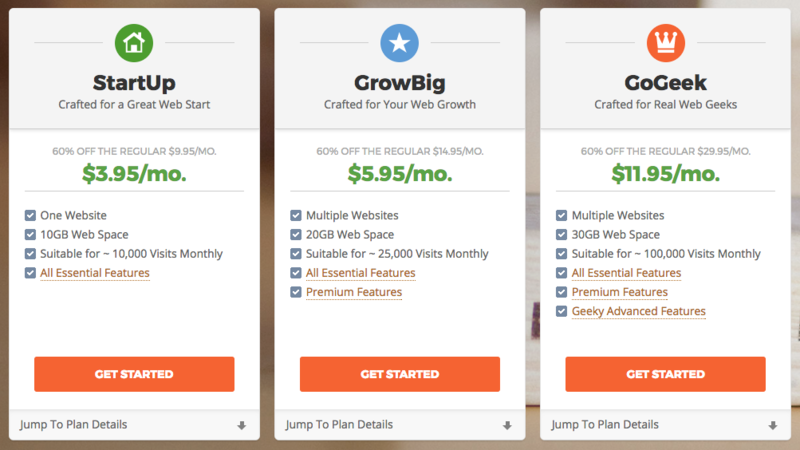 GrowBig provides more developed websites with 20GB of space, all essential features, and all premium features, which includes premium support, speed, and security. The plan is suitable for 25,000 monthly visits and has an introductory rate of $5.95 per month. Once your initial billing period ends, however, the price increases to $14.95 per month. For those with requirements to support up to 100,000 monthly visitors, the GoGeek plan includes all of SiteGround’s top services, including a server that is shared by fewer users, powerful eCommerce tools, and pre-installed Git. The service starts at $11.95 per month but increases to $29.95 per month after your initial signup period. NOTE: None of these plans can be purchased using month-to-month billing. SiteGround’s focus on the customer is clear not only from their outstanding customer support, but also from the service itself. The servers are zippy, providing visitors with quick loading times and virtually no waiting. Simply put, SiteGround makes everything about the website creation and hosting process easy and is proving to be our go-to host.